AIN’T NOTHIN’ PROUDER THAN CHOWDER! When the cold weather hits, something inside me seems to purr at the mere mention of soup. Just the thought of that steaming bowl of soup brings visions of snuggly instant contentment. And many soup aficionados will agree that the chopping and stirring process of making the big pot of chunky ingredients feels warming. Perhaps its knowing that within the hour I’ll be brandishing my soupspoon and ravishing the big bowl that offers reassurance a delicious, homey meal is on the way. This tasty kettle contains a chowder that is neither thick nor watery, but deliciously in-between. Each spoonful is richly textured with the bits of finely ground almonds and fully loaded with little chunks of carrots, celery, broccoli, and beans. To make this a satisfying entrée, serve the chowder with a salad and hearty whole-grain bread. I hope you’ll forgive me for this no-photo presentation. Truth is, my honey and I were in too much of a hurry to chow-down this tasty pot of chowder! 1. Preheat the oven to 350 degrees. Place the almonds in a heavy-duty plastic bag, place it on a firm cutting board, and use a hammer to coarsely chop them. Place the almonds on a baking sheet and roast them for 8 minutes. Cool and finely chop them in the food processor. Set them aside. 2. Combine the 8 cups water, carrots, celery, onion, parsley, and garlic in a large stockpot. Bring the ingredients to a boil, turn the heat down to medium, cover, and simmer for about 20 minutes. 3. Add the broccoli and beans and simmer about 10 minutes longer. Then add the 2 cups water and lemon juice along with the reserved finely chopped almonds. Simmer another 5 minutes to blend flavors thoroughly. 4. Season with cayenne, salt and pepper. Makes 6 to 8 servings. I love teaching plant-based cooking classes. What gives me so much pleasure is seeing the surprised looks and hearing the delightful expressions that come from students who are amazed that plant-based foods that spotlight nuts actually taste pretty darned good and are crammed full nutritious natural ingredients. 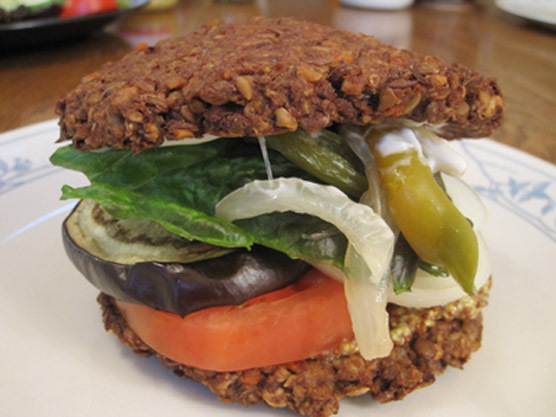 The menu for a recent cooking class featured these very nutty bean patties made from black beans, pine nuts, and walnuts. The students loved them so much, they made both platters of patties disappear. While walnuts and pine nuts are quite different in nature, they do have some beneficial health attributes in common. Both contain significant levels of arginine to encourage good blood flow, phytosterols to regulate the absorption of cholesterol, and antioxidants that protect our cells from oxidation. They excel in healthful mono and polyunsaturated fats. Both nuts contain plenty of protein, fiber, B vitamins, especially folate, and vitamin E.
Focusing on their uniqueness, walnuts score very high in the all-important omega-3 fatty acids with 9.08g for 3.5 ounces that help to reduce inflammation in the arteries. Pine nuts contain no omega-3 fatty acids, but they do have a whopping 1324 mg of copper for 3.5 ounces to help protect the bones. Walnuts contain 2.94 mg of Vitamin E, but pine nuts stand out with their 9.33 mg of Vitamin E for 3.5 ounces. Walnuts deliver 104 mg of calcium, while pine nuts contain only 16 mg. Clearly, each nut, has individual strengths in particular nutrients, driving the point that no single nut stands out as superior. Variety works best. While these nutty bean patties deliver a rich savory flavor, they look surprisingly like chocolate cookies dotted with chocolate chips. Enjoy these with fresh salsa on top or tuck them into a whole-wheat pita with lots of trimmings like chopped tomatoes, onions, cucumbers, and shredded lettuce. You can also enhance them with your favorite barbecue sauce. This is one of the delicious recipes from my cookbook, The Nut Gourmet: Nourishing Nuts for Every Occasion. 1. Preheat the oven to 400 degrees and lightly oil a large baking sheet or line it with parchment paper. 2. Combine the pine nuts and walnuts in the food processor and process until they are finely ground. Transfer to a large mixing bowl and set aside. 3. Put the onion into the food processor and chop until it is minced. Transfer to the bowl with the nut meal. 4. Measure 1/2 cup of the black beans and add them to the bowl with the nut meal. Put the remainder of the beans into the processor. Add the oat bran, water, salt, cumin, coriander, chili powder, garlic powder, and pepper and process until well blended. Spoon the mixture into the nut meal and mix well. 5. Drop the mixture from a large spoon onto the prepared baking sheet to form nine or ten 3-inch patties. Flatten the patties slightly so they will bake evenly. Bake for 12 to 14 minutes. Turn the patties over with a metal spatula and bake 10 to 12 minutes longer. Note: If you prefer to use canned beans rather than cooking beans from scratch, 1 1/2 (15-ounce) cans will give you the 2 cups of beans needed for this recipe. Rinse and drain the beans before using. While there is still concern about salmonella contaminated pistachios, safe sources do exist. Check your local supplier, and ask questions about their suppliers. When you locate safe sources, stock up on them, prepare the incredibly delicious recipe below, and bone up on some heart-friendly pistachio facts. Aside from being a tasty snack and a delicious addition to desserts, main dishes, soups, salads, sauces, and salad dressings, pistachios have proven themselves to be highly nutritious and medically effective in lowering the risk for coronary heart disease. Several studies in recent years have focused on the natural cholesterol-lowering effects of pistachios without the use of statin drugs. One study conducted at Penn State University was a controlled feeding study using the American Heart Association Step 1 diet. The Step 1 study successfully demonstrated the powerful effects of pistachios in lowering total cholesterol by 8.4 percent and LDL cholesterol by 11.6 percent when eaten daily in three-ounce portions. Pistachios also contain high levels of antioxidants that aid in reducing inflammation in the arteries. Another study conducted in Turkey and published in Nutrition, Metabolism & Cardiovascular Disease in 2006, examined the effects of pistachios on plasma lipid profile and oxidative status in 24 healthy men and 20 healthy women. After one week on their normal diets, half the group continued their regular diet, while the other half substituted pistachios for 20% of their daily calorie intake for three weeks. Before and after the study, blood tests were charted for LDL (the bad cholesterol), HDL (the good cholesterol), total cholesterol, triglycerides, MDA (malondialdehyde), and AOP (antioxidant potential). After the three weeks, the pistachio group was found to have significantly decreased their total cholesterol, MDA levels, and total cholesterol to HDL levels, and the LDL/HDL ratios. The results showed that those on the pistachio diet decreased oxidative stress, improved their total cholesterol, and increased their HDL levels. Those irresistible little green wonders are packed with protein and fiber, yet they are low in carbohydrates. Their high levels of good fats, mostly monounsaturated (fats), are part of their charm in lowering cholesterol. Pistachios are also a good source of arginine, a highly respected amino acid needed for the body to manufacture nitric oxide, known for its ability to dilate the blood vessels. Natural plant fats called phytosterols are nature’s way of preventing the absorption of excess cholesterol into the blood. After peanuts, pistachios score next highest in phytosterols among the nut family with 214 mg of phytosterols for 3.5 ounces. If you need a boost in potassium, count on pistachios with 1025 mg for that same 3.5 ounces. If you’re deficient in minerals like iron, zinc, copper, magnesium, or selenium, you might enjoy snacking on two generous handfuls of pistachios a day—that’s equal to about 3.5 ounces. For so many nutritional needs, you can consider pistachios among your good friends. And to reap the benefit of pistachios to the fullest, be sure to reduce your intake of other dietary saturated fats, such as dairy products, meat, chicken, or fish. The studies and nutritional information were conducted using raw pistachios. Kocyigit, A, A.A. Koylu, H. Keles, “Effects of Pistachio Nuts Consumption on Plasma Lipid Profile and Oxidative Status in Healthy Volunteers.” Nutrition, Metabolism & Cardiovascular Disease. 2006 16(3):202-9. Here’s a dish that frames beautiful, bright green pistachios with a backdrop of a golden brown garbanzo paté. Served as a casual, make-ahead dish, the paté becomes a tasty hot or cold filling for a sandwich. Cut it into squares and serve it as appetizer finger food at a party or picnic. To turn the paté into a hot or cold signature entrée, cut it into slices or wedges and serve them on a lettuce-lined platter with a dollop of Tofu Sour Cream and a sprinkling of paprika and minced chives topping each slice. 1. Line a 9 x 5 x 3-inch loaf pan or a ring mold with enough plastic wrap to drape over the sides and set aside. 2. Combine the onion, carrot, garlic basil, curry powder, cumin, salt, pepper, and thyme in a large, deep non-stick skillet. Add the soy sauce, olive oil, and lemon juice and cook and stir over high heat for 3 to 4 minutes or until the onion is soft and transparent. Reduce the heat to medium. 3. Add the garbanzo bean flour to the skillet and add the water, a little at a time, stirring constantly with a wooden spoon until the mixture is smooth. Adjust the heat to medium-high, if needed, and cook for 20 to 25 minutes, stirring frequently, until the mixture reaches the consistency of very thick porridge and begins to pull away from the sides and bottom of the pan. A thin, dry crust will form on the bottom of the pan. 4. Add the pistachios and stir well to distribute them evenly throughout the mixture. Spoon the paté mixture into the prepared loaf pan or ring mold, pressing firmly to eliminate any air spaces. Set aside for about 30 minutes to cool the paté. Fold the excess plastic wrap over the paté, covering it completely, and chill for at least 4 to 12 hours to firm. 5. Uncover the paté and unmold it onto an attractive serving platter. Garnish the top with quartered cucumber slices and surround the paté with the tomato halves topped with cucumber slices. Tuck a few springs of herbs around the base of the paté and cut it into serving slices or wedges. Note: Garbanzo bean flour, also called chickpea flour, can be found in Middle Eastern or Indian markets. Because this special dish needs to be refrigerated for a minimum of 4 hours to cool and firm, begin preparation several hours ahead or the day before. Variation: Other bean flours, such as lentils or green split peas, can be substituted for the chickpea flour. To create your own bean flour, measure 2 cups of dried green or brown lentils or green split peas and grind them into flour in a small electric mini chopper-grinder or coffee grinder. This quantity will equal the chickpea flour measurement. You will also need to increase the water measurement by approximately 2 tablespoons. Combine all the ingredients in a food processor and process until smooth and creamy. Use immediately or chill for an hour or two before serving. Refrigerated, Tofu Sour Cream keeps for 1 week. While my cookbook, The Nut Gourmet, was in the editing process, my editor suggested I include some bean spreads made with nuts. That was a great idea I hadn’t even thought of. It was my husband who came up with the idea of putting a dark bean recipe and a light bean recipe together to form the yin yang symbol. Wow! Another great suggestion I could instantly picture in my mind. That very afternoon my kitchen was buzzing with the food processor in full gear as I concocted the recipe below. It makes a great party dish that can be prepared a day ahead and always gets conversation flowing. If you’re a bit intimidated by the artistic aspect, set that fear aside and simply enjoy two separate spreads that make delicious party food. Both recipes can serve as a sandwich filling, an endive filled appetizer, stuffing for a mushroom appetizer, or just a succulent spread over whole grain bread, pita, bagels, or crackers. Nutritionally, you can’t beat beans for their wonderful high protein, high fiber, and generous soluble fiber that help to lower cholesterol. Besides, they’re downright satisfying. With the addition of nuts, you’ve got an even better nutrition boost. Macadamias contain the highest level of monounsaturated fats of all the nuts. That’s the good fat that helps to lower cholesterol. And walnuts are king of the omega 3 essential fatty acids that help to reduce inflammation in the arteries and reduce the risk of coronary artery disease. Now, what’s with the yin yang treatment? The symbol has Taoist origins. The circular form represents the universe, while the dark and light colors suggest opposites in the universe. And since nothing in this world is all black or all white, a small white dot appears in the dark portion and a small black dot accents the light section. active yang song while the Walnutty Black Bean Spread balances with a feminine, cool, dark, and passive yin song. While famous sculptors used a hammer and chisel to create their artistic form, my tool of choice is nothing more than the simple spoon. Here’s to delicious eats and a touch of creative joy! 1. Place the macadamia nuts into the food processor and process briefly to break the nuts into smaller chunks. 2. Add the remaining ingredients to the food processor and process until thick and slightly chunky. Stop the machine occasionally to scrape down the sides of the work bowl. 3. If you prefer a smoother spread, first process the macadamia nuts into a paste in the food processor. Then add the remaining ingredients and process until smooth. 4. Transfer to one side of a serving dish and set it aside. Wash and dry the processor work bowl and blade. 1. Combine the beans, walnuts, vinegar, water, cumin, chili powder, and salt in the food processor and process until smooth. Stop the machine occasionally to scrape down the sides of the work bowl. 2. Add the onion flakes and pulse until they are incorporated. Transfer to the serving dish beside the Chunky Cannellini Mac Spread, and work with the back of a spoon to form the two spreads into the yin-yang symbol. Begin by forming the Chunky Cannellini Mac Spread first. Then, the Walnutty Black Bean Spread will fall right into place. Covered with plastic wrap and stored in the refrigerator, leftover Yin-Yang Nutty Bean Spread will keep for about one week. * Umeboshi plum vinegar is a unique vinegar made from the brine used to salt and pickle ume plums used in macrobiotic cooking. The vinegar has a tangy, salty, and delicately sweet flavor and is used sparingly as a seasoning. You can find this item in natural food markets but can easily substitute with seasoned rice vinegar.